Any good handyman or gardener worth their salt will be able to tell you that a garden shed is one of the most useful things in the world. Not only can garden sheds be used for loads of different purposes, but they also look great too. If you’ve got a garden shed of your own, you probably know how useful they are. But just in case, here are 10 great uses for garden sheds – some of which you may not have thought of! This is pretty self explanatory. Garden sheds are great to keep things in, from lawn furniture to power tools or even camping equipment. Good garden sheds are set on a foundation and sealed properly, so your stuff will remain dry and safe. Those of you with green thumbs will know just how important it is to make sure your plants stay protected, all year round. 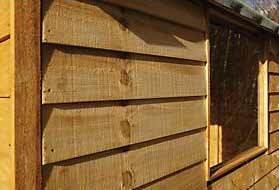 Garden sheds are perfect places to overwinter your more delicate plants, and can be fitted with heat and light should you so require. If you’ve got an unruly, yet beloved, family pet, why not convert your garden shed into somewhere for them to play and sleep? Many people choose to have their pets sleep outside, especially if they’re over-boisterous or over-large! A garden shed can be easily converted into a playhouse for little people, simply by de-cluttering and giving it a lick of paint. Make your kids’ playhouse fun, bright and safe to play in, and they’ll be sure to enjoy it all year round. No matter what kind of work you do, if you work from home you may find yourself wishing for a bit more peace and quiet, or even a bit of extra room. A garden shed can be turned into a convenient workspace simply by fitting it with a desk, chair, and a few home comforts. Or, if you’re a bit more hands-on, a work bench and tool rack. Who doesn’t love the idea of their very own man cave? Man caves aren’t just for men, they’re fun for the whole family. Fit your out with comfy seating, a TV, games consoles, and a hifi. If you fancy yourself as a bit of a bartender, why not convert your garden shed into a makeshift bar? A garden bar is perfect for warm summer nights, and you can entertain friends and family in the evening by showing off your mixing skills. A garden shed can be easily converted into a sauna or steam room, simply by sealing all cracks and gaps, treating the inner and outer walls, and installing the necessary equipment and ventilation. Don’t forget to complete your sauna by fixing it up with comfortable benches and towel racks, for the ultimate at-home luxury experience. Gym memberships can be pretty extortionate, so if you’ve got a garden shed going spare and a little extra cash to invest in equipment, you could be on your way to having your very own home gym. The great thing about a home gym is that, once you’ve made the initial investment, you won’t have to pay out any more money. And best of all, a home gym requires little to no effort to attend! If you’re in need of a romantic getaway for two, a garden shed could be the answer. It may not sound romantic right now, but with a little hard work you could transform your garden shed from a rundown shack into a love shack! All it takes is some mood lighting, a comfy place to relax and maybe a TV and DVD player for watching soppy movies together. Don’t forget the wine!